This is great tonight, join in kids, join in! Thanks a lot guys. Last night was a lot of fun. Some good music too. Here is the set with the tracklist. Te recording skips a little bit during second half of the show. I have no idea why. I'll check into my settings for the next show. Tonight @ 5:30 PM PST/8:30 PM EST! Tracklist is inside zip file. 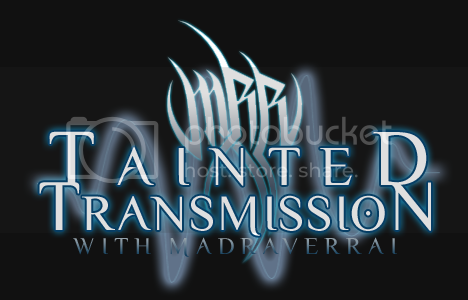 MadRaverRai will be spinning Tainted Transmission on August 30th, 2009 at 8:30 PM EST (5:30 PM PST) via Stickam! Also, this will be the last WEEKLY Tainted Transmission. Starting in September, Tainted Transmissions will be broadcasted every third Saturday of every month. One of our fellow dedicated GSC members, MadRaverRai, will be spinning Tainted Transmission on September 20th, 2009 at 8:30 PM EST (5:30 PM PST) via Stickam! As you may have noticed, Tainted Transmission is now once a month. Starting September, Tainted Transmission broadcasts every THIRD Sunday of the month. Click below to join the show when it starts. Click here to join fellow GSCers for two hours of good music and socializing! This Sunday's show is gonna rock so hard. Hope to see you guys there. Tainted Transmission episode 32 tomorrow at 8:30pm Eastern. been pumped for weeks for this!!! My dog turned 1 today and in celebration Marthy and I want to do a show this Saturday on stickam. Stay posted in this thread for the time. Tonight at 8:00 PM EST / 5:00 PM PST!!!! Tainted Transmission Episode 33 tonight at 8:30pm Eastern! December 20 is the next one.